The Oaks Altay Large Bollard Light Is A Stainless Steel Finish With An Opaque Polycarbonate Lens. The Oaks Altay Small Bollard Light Is A Stainless Steel Finish With An Opaque Polycarbonate Lens. The Oaks 8071 Bollard Light is in Black and is IP43 rated. The Firstlight Delta Small LED Bollard Light is in a graphite finish and is IP54 rated. The Firstlight Evo Large Square CREE LED Bollard Light is in a Graphite finish and is IP54 rated. The Firstlight Evo Small Square CREE LED Bollard Light is in a Graphite finish and is IP54 rated. The Elstead Helsinki Bollard Light is part of the Scandinavian collection. 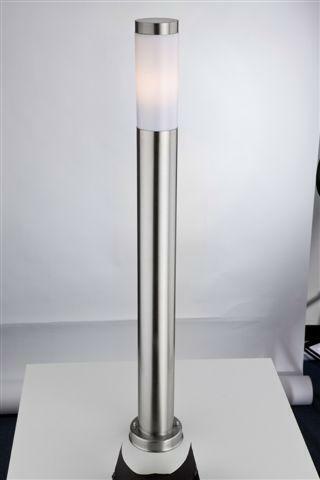 The Oaks Kelso LED Post Light is in a Stainless Steel finish. The Firstlight Large Bollard Light is made from die cast aluminium in a Black finish and is IP44 rated. The Oaks Black Bollard Light is 1 metre tall and has a 20 year anti-corrosion guarantee. The Oaks Low Energy Black Bollard Light is 1 metre tall and has a 20 year anti-corrosion guarantee. The Firstlight Plaza 6407ST bollard is in a stainless steel finish. The Firstlight Plaza Small Bollard Light is in a Stainless Steel finish with a polycarbonate diffuser. The Firstlight Small Bollard Light is made from die cast aluminium in a Black finish. The Franklite Terran Large Bollard Light is a marine grade Stainless Steel light with a clear polycarbonate lens. The Franklite Terran Small Bollard Light is a marine grade Stainless Steel light with a clear polycarbonate lens. The Oaks Titanio Large Bollard is in a Simulated Wood finish. The Oaks Titanio Large Bollard is in a Stainless Steel finish. The Oaks Titanio Small Bollard is in a Simulated Wood finish. The Oaks Titanio Small Bollard is in a Stainless Steel finish. We offer a range of bollard lights which are available in different sizes, designs and finishes to suit you. Please feel free to browse our extensive range of lighting we have available online today as we are sure we have the right light for you. We are proud to say that we supply quality lighting at competitive prices. If you are still unsure as there is so much choice why not contact our sales team who will be more than happy to help you.